Creamy butter pecan ice cream sprinkled with crunchy pecans. Case Dimensions: 14.25 in. x 7.13 in. x 4.05 in. 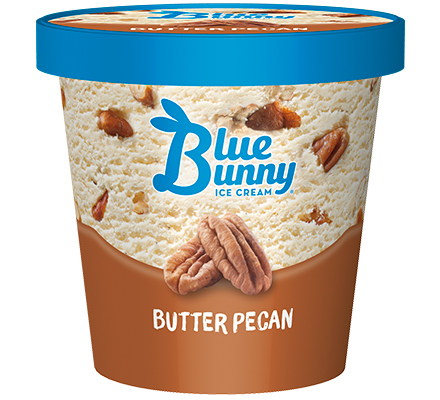 Ingredients: Milk, Skim Milk, Cream, Sugar, Pecans (Pecans, Cottonseed Oil, Butter), Corn Syrup, Contains 1% or less of Vanilla Extract, Natural Flavor, Ground Vanilla Beans, Salt, Carob Bean Gum, Guar Gum, Carrageenan, Mono & Diglycerides, Cellulose Gel, Cellulose Gum, Annatto for Color. Allergen Information: Contains Milk, Pecans. Manufactured in a facility that processes almonds, brazil nuts, cashews, coconut, hazelnuts, macadamia nuts, peanuts, pecans, pine-nuts, pistachios, walnuts. Note: Nutritional properties of products intended for sale in high altitude areas may vary due to specific manufacturing practices used to maintain product quality. Please refer to the nutrition facts panel on package for current details. Get our newsletter delivered to your inbox for rebates, new products and recipes, and insights to help build your business. © Copyright 2019 Wells Enterprises, Inc. All Rights Reserved.